Iguanas are big herbivorous lizards from the reptile family. Iguanas are found in tropical areas in the Caribbean and central america and other islands. Even though there are many types of iguanas, the most know is the green iguanas which can used as house pets and also children's crafts. Iguana crafts are very popular, especially when learning the letter 'I'. Children can easily make an iguana from paper or from craft sticks and woodsies. Today we will show you how to make an iguana who can open and close his mouth. Start off by printing out this following iguana template. You will notice that the iguana is in 2 pieces...cut each part out separately. Glue the top part of the iguana on the top of the clothespin (in front of the metal ring) and the bottom part of the iguana on the bottom of the clothespin. Make sure that they line up to look like a whole iguana. Then roll a red strip of paper, as seen in the picture above, and then glue it where the iguana's tongue should be (on the inside of the clothespin). Have fun showing off your moving iguana to your friends. 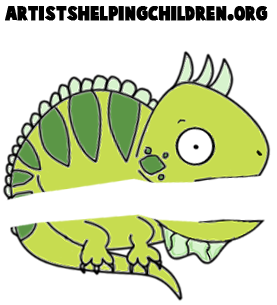 3-D Iguana Craft for Kids - -Learn to make an iguana artwork in 3D! 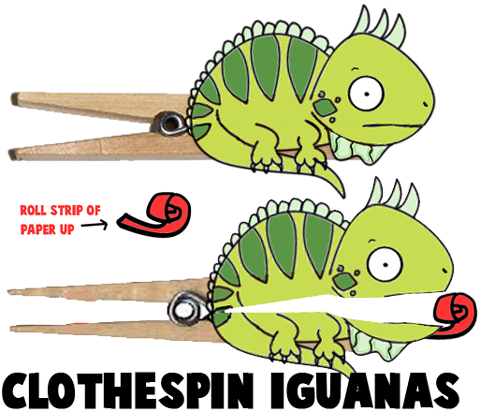 Craft Stick Iguana to Make - - Make yourself an Iguana out of craft sticks. How to Make a Stuffed Iguana Arts & Crafts Project - - Don't you love those shiny, stuffed iguanas that adorn computer monitors and kid's rooms? They are easy enough to make if you have a pattern (included), a sewing machine and a little time. Intriguing Iguanas Craft Idea- - Celebrate shimmering rainforest reptiles! Crayola Metallic Colored Pencils bring out the texture and beauty of these intelligent creatures. Iguana Greens Craft for Preschoolers and Toddlers - - Preschoolers may need help with this project. Have fun!